Unfortunately children are not natural born yogis and teaching them can be quite challenging. From practicing yoga as much as I can with my 5-year-old daughter, I’ve developed some tips for teaching yoga to kids. Not only does yoga offer us a chance to spend time with our kids while tuning into our bodies and breath, yoga helps children practice valuable skills like listening, cooperation, balance, and body awareness. 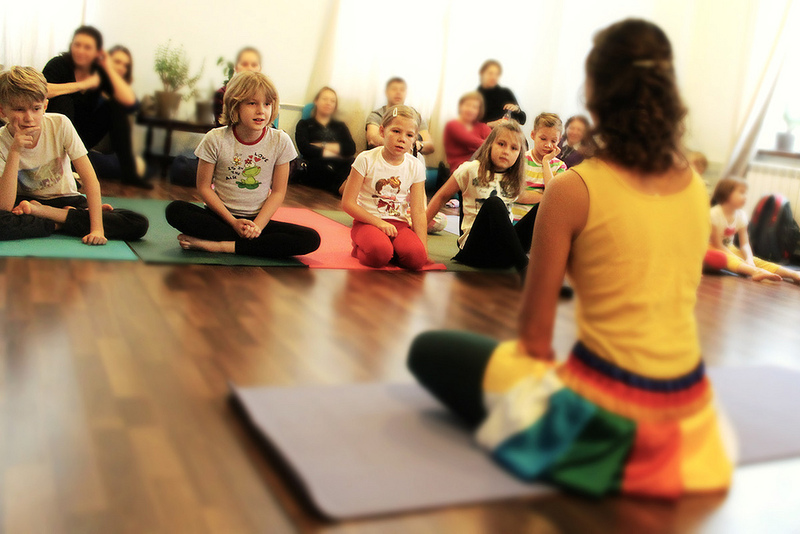 One of the biggest challenges in getting kids involved with yoga is holding their attention. While teaching yoga to groups of kids can be more challenging than doing yoga with one or two of your own children, there needs to be enough variation to keep little bodies and minds engaged. It’s helpful to have a plan on how you’re going to structure your yoga time, but then not hold to it too rigidly. Be okay if you need to change things up, and go with whatever seems to be interesting to children in the moment. Introduce yoga to children by talking to them about how and why yoga is good for our bodies. Talk about how we stretch our muscles to become more flexible and work our muscles to become stronger. Most kids love to sing. Chanting is a way of getting out energy and a starting point for learning breath control. Start with a simple “Om” chant or a song to open the practice. My preschooler likes to sing at the top of her lungs, so we chant three Om’s really loud, and get some giggles out too. You could also try a call and response chant, which promotes good listening skills. Yoga games are a good way to release all that wiggly energy at the start of the practice. Try Freeze Yoga: play music and let everybody dance and jump until the music stops, then tell everybody to freeze in a called-out yoga pose. Try Yogi Says, like Simon Says but with yoga poses. Another fun game is mirroring, where everyone takes turns being the leader while others mimic their movements into and out of yoga postures. Storytelling provides a framework for teaching yoga poses to kids and offers a chance to notice our connection to the natural world as we use our bodies to take the shape of animals, plants, and objects around us. Yoga mythology offers a chance to learn about the origin of poses like the Warrior sequence, Goddess pose, and the monkey god’s favorite pose, Hanumanasana. It’s also fun to make up your own stories, or have kids make up stories, as you turn your bodies into boats, airplanes, dogs, cats, lions, trees, mountains, moons, and stars. Breaks can take the form of Child’s pose, or sitting cross-legged or sitting in Hero’s pose while everyone quietly listens to their own breath. Silently counting inhales and exhales improves concentration and helps everyone tune into how their body is feeling. Discuss whether you feel tired, excited, or calm. Partnering in yoga teaches cooperation and can make yoga more dynamic and interactive. Have children sit facing a partner with their feet and hands wide while touching the other person’s feet and hands. Then with hands clasped, partners gently pull each other back and forth in a rowing motion. While you row, sing “Row, Your Boat” for another opportunity to incorporate singing in yoga. Most kids are fascinated by the idea of learning a language other than their own. Teaching kids the Sanskrit names for a few different yoga poses is a fun way to introduce them to the history and culture of yoga. If your little ones aren’t too antsy and can spend a few more minutes engaged in yoga, end with a resting pose like Corpse pose. Or if you want to introduce meditation to kids, one of my favorite approaches is from Kerry Lee MacLean’s Moody Cow Meditates using a Mind Jar, which you can easily make at home. What are your tips for teaching yoga to kids and incorporating yoga into their lives?